Ahmose, son of Ebana, was an officer in the Egyptian army during the end of the Seventeenth Dynasty (Second Intermediate Period) and the beginning of the Eighteenth Dynasty (New Kingdom). Ebana (or Ibana or Eben) was the name of his mother, who was presumably an important woman as Ahmose choses to refer to her not his father in his inscription. His father, Baba, had also been a member of the army (serving under Seqenenre Tao II in the early campaigns against the Hyksos). Ahmose spent most of his military life as a sailor. 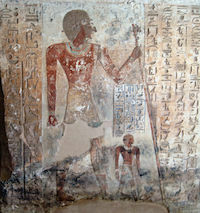 He fought at Avaris, Sharuhen (in Palestine) and in Nubia in the service of Seqenenre Tao II, Kamose, Ahmose I and Tuthmosis I. Ahmose received many honours for his bravery in battle and recounted his deeds on the wall of his tomb. The Crew Commander Ahmose son of Abana; the justified; he says. I speak to you, all people. I let you know what favours came to me. I have been rewarded with gold seven times in the sight of the whole land, with male and female slaves as well. I have been endowed with very many fields. The name of the brave man is in that which he has done; it will not perish in the land forever. He speaks as follows. I grew up in the town of Nekheb, my father being a soldier of the King of Upper and Lower Egypt, Segenenre, the justified. Baba son of Reonet was his name. I became a soldier in his stead on the ship “The Wild Bull” in the time of the Lord of the Two Lands, Nebpehtire, the justified. I was a youth who had not married. Now when I had established a household, I was taken to the ship “Northern”, because I was brave. I followed the sovereign on foot when he rode about on his chariot. When the town of Avaris was besieged, I fought bravely on foot in his majesty’s presence. Thereupon I was appointed to the ship “Rising in Memphis.” Then there was fighting on the water in “Pjedku” of Avaris. I made a seizure and carried off a hand. When it was reported to the royal herald the gold of valour was given to me.Then they fought again in this place; I again made a seizure there and carried off a hand. Then I was given the gold of valour once again. Then there was fighting in Egypt to the south of this town, and I carried off a man as a living captive. I went down into the water-for he was captured on the city side-and crossed the water carrying him. When it was reported to the royal herald I was rewarded with gold once more. Then Avaris was despoiled, and I brought spoil from there: one man, three women; total, four persons. His majesty gave them to me as slaves. [ ] Then Sharahen was besieged for three years. His majesty despoiled it and I brought spoil from it: two women and a hand. Then the gold of valour was given me, and my captives were given to me as slaves. Now when his majesty had slain the nomads of Asia, he sailed south to Khent-hen-nefer, to destroy the Nubian Bowmen. His majesty made a great slaughter among them, and I brought spoil from there: two living men and three hands. Then I was rewarded with gold once again, and two female slaves were given to me. His majesty journeyed north, his heart rejoicing in valour and victory. He had conquered southerners, northerners. Then Aata came to the South. His fate brought on his doom. The gods of Upper Egypt grasped him. He was found by his majesty at Tent-taa. His majesty carried him off as a living captive, and all his people as booty. I brought two young warriors as captives from the ship of Aata. Then I was given five persons and portions of land amounting to five arurae in my town. The same was done for the whole crew.Then came that foe named Tetian. He had gathered the malcontents to himself. His majesty slew him; his troop was wiped out. Then I was given three persons and five arurae of land in my town. Then I conveyed King Aakheperkare, the justified, when he sailed south to Khent-hen-nefer, to crush rebellion throughout the lands, to repel the intruders from the desert region. I was brave in his presence in the bad water, in the towing of the ship over the cataract. Thereupon I was made crew commander.Then his majesty [was informed that the Nubian] .. At this his majesty became enraged like a leopard. His majesty shot, and his first arrow pierced the chest of that foe. Then those [enemies turned to flee], helpless before his Uraeus. A slaughter was made among them; their dependents were carried off as living captives. His majesty journeyed north, all foreign lands in his grasp, and that wretched Nubian Bowman head downward at the bow of his majesty’s ship “Falcon.” They landed at Ipet-sut. After this (his majesty) proceeded to Retjenu, to vent his wrath throughout the lands. When his majesty reached Nahrin, his majesty found that foe marshalling troops. Then his majesty made a great slaughter of them. Countless were the living captives which his majesty brought back from his victories. Now I was in the vanguard of our troops, and his majesty saw my valour. I brought a chariot, its horse, and him who was on it as a living captive. When they were presented to his majesty, I was rewarded with gold once again. I have grown old; I have reached old age. Favoured as before, and loved [by my lord], I [rest] in the tomb that I myself made.